One of the most common and trite business cliches is the term low-hanging fruit, implying activities we could do which would yield fast, easy results. Low-hanging fruit also implies a limited amount, a resource that is depleted quickly. Do such things exist in digital marketing and digital advertising? Yes, they do. The lowest hanging fruit, the strawberry of digital advertising (for those that don’t know, strawberries grow at ground level) is available to businesses large and small, budgets large and small. Once set up, it practically runs itself, yet delivers consistently good results over time. What is this mythical panacea? Retargeting advertising is the process of showing digital ads to people who already know us, either because they follow us on social media or they’ve been to our website. If you’ve ever been browsing on a shopping website and then seen the product you were shopping for following you around the web, you’ve seen retargeting in action. Retargeting works by showing ads to audiences who already know us. They’ve been to our digital properties; with website-based retargeting, they’ve cruised around pages on our website. In contrast to cold advertising, retargeting reminds people that they’ve had some level of interaction with us. It’s more of a digital tap on the shoulder than anything else. According to some industry studies, when properly executed, retargeting delivers 10x greater returns on investment compared to digital advertising served to cold audiences. This is the lowest-hanging fruit in digital advertising – and depending on our website traffic, it may cost us only a few dollars a day. Every business, large or small, should have a retargeting program in place to win back people we’ve worked hard to attract. It should be the first advertising program we put in place and the last ad budget we cut when things get tight. Start retargeting in 3 straightforward steps. Pick an advertising vendor: Google AdWords, Facebook, etc. Whatever vendor you pick, be comfortable setting up basic ads with them. If you’re not, hire someone to do it for you. Deploy retargeting tags on your most important pages. Typically, these are pages where a user will convert, from an eCommerce shopping cart page to a product info/demo page to a lead form/landing page. Tag each page with its own campaign tag and with a master retargeting tag. Run contextually appropriate ads. If someone’s in your custom roasted coffee page, run an ad campaign to that retargeting audience for custom roasted coffee – not left-handed smoke shifters. 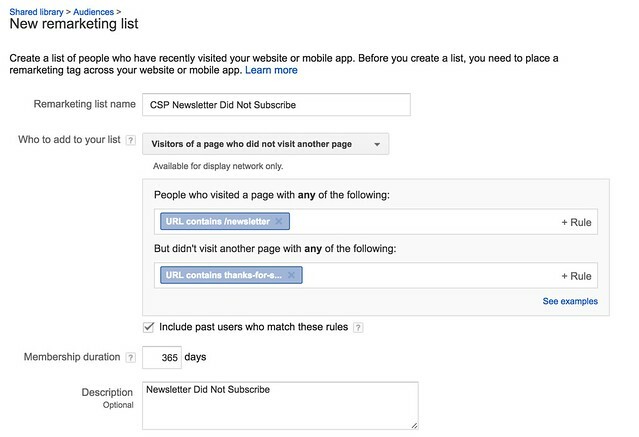 The goal of the ad program is simple: remind those people who didn’t subscribe to come back and subscribe. It uses Google AdWords, a retargeting tag that tracks my newsletter page, and ads to remind people to subscribe. The uses for retargeting are limited only by what people could do on your website. Are you retargeting? If you’re not, get started today.